The diplomatic and historic background as revealed by the records and documents of the World War and its aftermath, covered in the preceding pages, portrays war and the price of war. The price is appalling. Unfortunately, or perhaps fortunately, we cannot show the cost of peacebut peace has its price too. The documentary evidence certainly indicates that Germany did not instigate the war. However, it is not for us to judge France, England, and their allies. They had their choice of war or peace. They knew the cost of war. They must have decided that the price of peace would have been greater. Germany was taking their markets. Unemployed walked their streets in increasing numbers. They believed they saw danger of sinking to the status of second or third rate nations. The trend of events in the Pacific since the World War might indicate that America, too, will have to make its choice between paying the price of another war, or paying the price of peace. From now on Japan will assume sole responsibility for the political and economic regulation of Pacific Asia, and at the proper moment will deal with the conception held abroad that China is an independent nation to whom America might sell airplanes and make wheat loans at will. "In the opinion of the American people and the American government no nation can, without the assent of the other nations concerned, rightfully endeavor to make conclusive its will in situations where there are involved the rights, the obligations, and the legitimate interests of other sovereign states." The League of Nations' plan for the reconstruction of China by joint international action was courteously rejected by Japan with the assertion, "To keep order in east Asia, we must act alone on our own responsibility ... Any joint operations undertaken by foreign powers, even in the name of technical or financial assistance ... are bound to acquire political significance. Japan must, therefore, object to such undertakings." While Japan's future aims are not defined, they clearly do not bode well for American trade. Between 1880 and 1930, a period of fifty years, Japan's population doubled, reaching over sixty-five million. The male working population is increasing at the rate of two hundred and fifty thousand a year. This growth creates an over-crowded condition, making necessary an industrialized state with large export trade if the population is to find employment. A ruthless trade war is being waged by Japan, a true believer in the philosophy of the survival of the fittest. In 1933, Japan made the greatest advance of any nation in industrial history, when her foreign trade increased 40 per cent over 1932. In the Philippines, the gain was 30 per cent; in Africa, 60 per cent; in Haiti, 1000 per cent, and in Latin America, 200 per cent. World trade in 1935 was approximately 60 per cent of what it was in 1929, yet Japan's share of world trade in 1935 was more than double what it was in 1929 and ten per cent greater than in 1934. America's trade in textiles has practically been driven out of South and Central America, where Japanese goods are sold at a price with which no North American nor South American manufacturer can compete. It has been said that "King Cotton" is now a subject of the Mikado. If our textile exports are cut off because of our inability to compete with Japan, one-third of America's cotton land will have to go out of production. American production in agriculture and industry is geared to world trade. If world trade is cut off and America can produce only what it will itself consume, corn and wheat lands also will go out of production, and many factories will close their doors. The civilian population will be subjected to gas attacks in the next war. 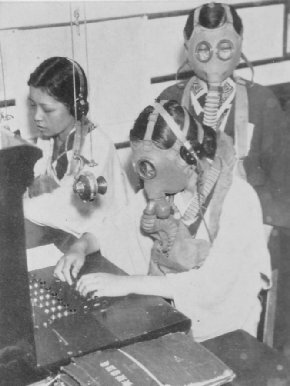 Telephone girls in Osaka, Japan, are getting used to the new gas masks issued in connection with the air defense campaign of instruction. Pacific that America's great danger lies. Some responsible historians are saying that even though America did not sign the peace treaties at the close of the World War, we are responsible for the maintenance of the boundary lines set up in these treaties because our representatives at the peace conference agreed to them. If all of the facts of the pre-war diplomacy had been before our representatives, we seriously doubt if they would have agreed to the post-war treaties. It is definitely established that the pertinent facts were deliberately concealed from them.